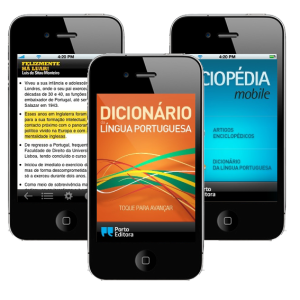 Porto Editora released the mobile versions of Diciopédia and ten dictionaries for iPhone, which are available for download since January 1, 2011. All iPhone applications were developed by Xpand IT in the Development Center at Viana do Castelo. Applications can be downloaded from iTunes Store. As this article is being published, the applications are on the top sales of iTunes Store, with the Portuguese Language Dictionary and DICIOPÉDIA Mobile on the 1st and 2nd place. The other applications are on top of the ‘paid’ applications, in the Reference category. With just on week on the market, the mobile applications provided by Porto Editora have become a great success among iPhone and iPod Touch users. On the first days after the release, there were about 30.000 downloads, most of them in Brazil. Diciopédia Mobile includes more than 25 thousand entries, plus the entries on the Portuguese Language Dictionary (aAO-dAO, Before / After the Orthographic Agreement), which can also be downloaded separately and free. iPad users will have a specific version of these products very soon, although the current versions for iPhone are also supported.